This image is from a computer simulation showing the development and evolution of the disk of a galaxy such as the Milky Way. Astronomers have long believed that most stars arehomebodies which stick close to their birthplaces. But a new simulationsupports the suggestion that our sun might have once hitchhiked through thegalaxy. 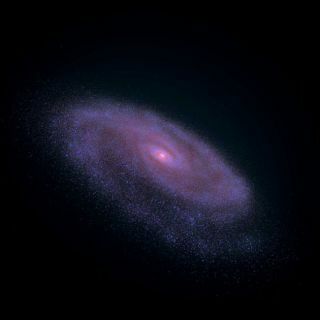 Where our sun or another star ends up migrating seems todepend on its position in a spinning spiral galaxy. Stars tagging along behinda massivespiral arm can get a gravitational speed boost that sends them into abigger orbit around the galactic center. The stars leading in front of a spiralarm may end up getting slowed by the arm's gravitational pull and fall backinto a smaller orbit. "Our simulation is still like a toy model, but a stepmore complex than the ones observing migrations before," said RokRoskar, an astronomer at the University of Washington in Seattle. Previous simulations followed star migration in a presetgalaxy. The new computer model goes back 9 billion years to track a galaxy'sevolution from a giant cloud of gas. It also follows individual stars frombefore birth until they die in a fiery supernova. Stars could travel from deep within the interior of agalaxy to its outer edges, and might even get passed around in a "spiralarm relay," Roskar told SPACE.com. Our sun currently has an orbitnear the outer edge of the galaxy. New simulation runs confirmed earlier work that showedhow star orbits can remain circular despite expanding or shrinking. Thatcounters assumptions that the gravitational tug-of-war would push and pullorbits into wilder elliptical shapes. The older research also undermines the assumption that amore elliptical or disturbed orbit reflects the older age of a star. "You can have a circular orbit for an old star thathas been whacked around by many spiral arms," Roskar said. Such simulations may help explain observations made byNASA's Hubble Space Telescope, which had raised another puzzle for astronomers.Conventional knowledge states that stars get younger and younger further out ina galactic disk, but Hubble turned up evidence that stars are actually mucholder beyond a certain point in the outer galaxy. Roskar and other researchers think that the olderstars lurking in the galactic fringe represent wandering wayfarers ratherthan local residents. "Older stars have had time to get out there,"Roskar noted. Wandering stars could also shake up the notion of galactichabitable zones. Such safe areas would not have the chaos and radiation ofstar nurseries, but would have enough heavy metals from previous stars tosupport planets conducive to life. Yet such zones could not be stationary asthe galaxy itself changes, or if our sun has migrated across many differentparts of the galaxy. "It seems impossible to talk about a galactichabitable zone without context," Roskar said. "Our sun has a verycircular orbit, so some assumed it's always been where it is. To me, it's notso clear that's true." The new simulation is detailed in the Sept. 10 edition ofthe Astrophysical Journal Letters.